Sometimes you want a huge fancy watch with lots of dials and gauges, and sometimes you just want to know what time it is. The Invicta Vintage Collection Brown Dial Men’s Watch 1461 is a sporty yet elegant watch that fits the bill for those occasions, and it would make a great everyday watch to add to your wardrobe. 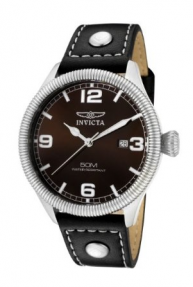 The Invicta Vintage Collection Brown Dial Men’s Watch 1461 is a very attractive timepiece with a classic style. The watch has a dark brown face with four large white numbers marking three, six, nine, and twelve on the dial. Large white marker bars indicate the other hours, so it is easy to tell the time, but the face stays uncluttered. There is a small date readout near the crown, and the visual features are rounded out by a second hand. The stainless steel bezel has a fluted coin edge, which give is it a very masculine but also vintage styling, and the diamond-shaped crown should be easy to manipulate. This is all attached to a black leather band with two large rivets and contrast stitching. This is one handsome watch. It’s also got a fairly large diameter, 44 millimeters, so make sure that it’s a good size for you before you purchase. It might dwarf some smaller wrists. This Invicta Chronograph watch has more dials. This watch should be fairly reliable. Swiss quartz movements are known for their accuracy, and I’ve seen no claims to the contrary in reviews of the Invicta brand. The flame-fushion crystal that the company uses is supposedly stronger than a sapphire crystal, and not as likely to shatter. That’s good, because you don’t want to scratch something that looks this nice. Reviewers loved the large numbers, and many mentioned that this would be a great watch for someone who is older or visually-impaired. While it’s easy to see in the daylight, don’t count on the glow-in-the-dark features, as they don’t work as well as promised. Some people mentioned that the date display is also hard to see, especially in contrast to the large numbers on the watch face. One reviewer added that the second hand did not land precisely on the hash marks–if this is important to you, you may want to examine the watch in person before buying to see if this is an issue. Although you might like the uncluttered look, some guys do want a watch with a few more dials. 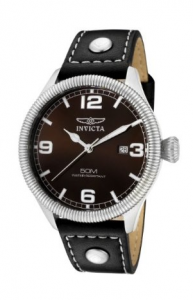 You might try the Invicta Specialty Black Chronograph Men’s Watch 11245, which retails for $495. If you want something similar but you need something that lights up better, try the Timex Easy Reader Men’s Watch T28071 for $39.95. The Timex has a nifty “indiglo” feature which lights up the whole dial when you press a button. 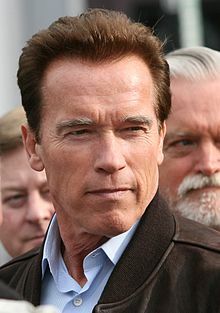 Arnold Schwarzenegger wears Invicta watches. My final caveat is price. Invicta seems to set a high retail price on their watches and then they immediately sell them for less so that people feel they’re getting a steal. Keep this in mind, and shop around before you purchase, so you’re not the one getting robbed. This watch is currently selling on many sites on the internet for about $45. Do not pay retail price. Most men are very satisfied with their Invictas, and the Invicta Vintage Collection Brown Dial Men’s Watch 1461 is no exception. The name stands for “invincible” in Latin, and you know you’re going to feel invincible with a stylish watch that adds a bit of flair to your outfit. Show the world you care about your appearance, and get out there and start enjoying yourself. This is a durable watch that can keep you company during your busy day, and you’re going to look sharp. Everything else should be this simple.